One of the things missing when Jilda and I perform is getting decent pictures. While reading one of the songwriter's discussion groups, one of the participants suggested getting a selfie stick so that you could at least shoot a posed picture at each of the venues you play. After thinking about this for a while, I ordered one from Amazon. 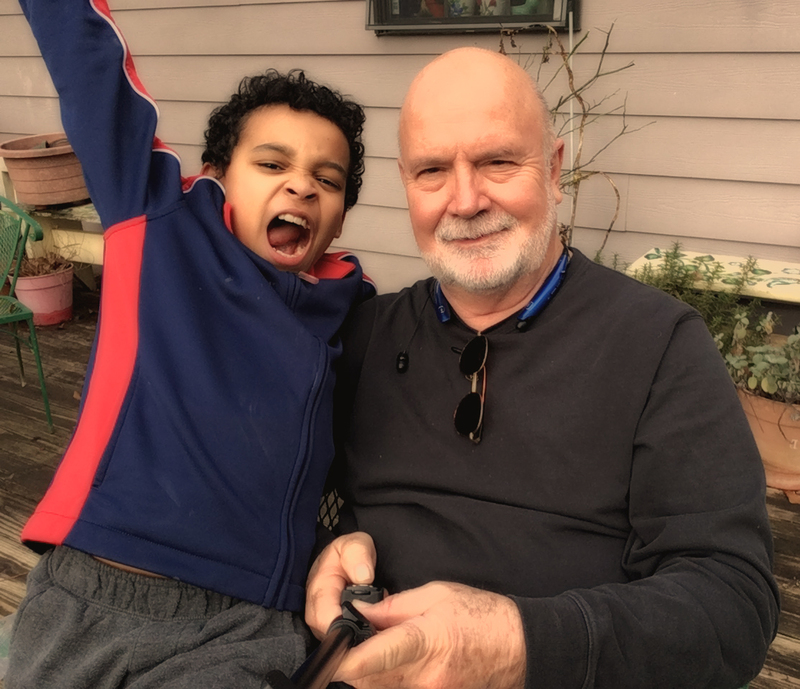 It came today and after a few minutes assembly, I snapped a picture of my great nephew Jordan and me. I think it will work fine. Today was a short day at school and rather than Jordan hanging around his Nana's office all afternoon, we swung by and boosted him from school. He was thrilled and we had a great time. The temperature was almost 80 degrees F today and we spent most of the time outside. We played toss the tree limb with Ol' Hook. The bulldog has chewed up the toys we've bought him, but I had a short stick of firewood about as round as the calf of my leg that we use as a fetch toy. It's too heavy to toss far, but carrying it around seems effortless for Hook. I hope your Wednesday has been a good one for you too. Jordan is a lucky kid. Actually I'm thinking that works both ways. Joeh probably hit it. But no matter, you guys seem to have fun in life and that counts! I can tell from your posts that you and Jordan have a special bond. I love seeing pictures of children. They are so uninhibited and unashamed about loving life. That kid is full of exuberance and you two make a good team. Not bad for a selfie.Taking a selfie with my heavy Canon Camera isn't easy. What a great way to spend the day! You and your nephew make for a wonderful selfie! This is a great shot Rick! Jordan looks like a ball of fun! Now I want a selfie stick. Great selfie; only next time, leave out the hands!! Selfie stick worked very well! My son has one, uses it for many things.